Aishling Kenny interviews Pádraig Schaler's Family, Headway Ireland's CEO Kieran Loughran, and Prof Andreas Bender from Munich University. Users who like Morning Ireland #2 on NeuroRehab and Pádraig Schaler on 07 Sep 2016. Users who reposted Morning Ireland #2 on NeuroRehab and Pádraig Schaler on 07 Sep 2016. 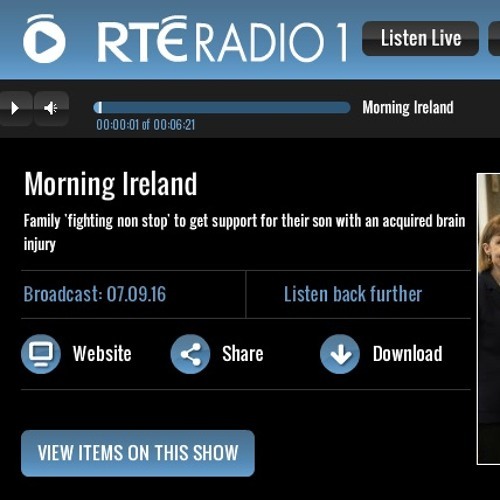 Playlists containing Morning Ireland #2 on NeuroRehab and Pádraig Schaler on 07 Sep 2016. More tracks like Morning Ireland #2 on NeuroRehab and Pádraig Schaler on 07 Sep 2016.